The Corrib project, which is crucial to Vermilion and ready to produce, is now in court once more over environmental issues. Vermilion seems determined to sustain its 7.5% dividend. With its reduced capital expenditures in 2016, down some $125 million from 2015 levels, and with Corrib production on the horizon as well as increased production in other areas, Vermilion looks relatively secure going into 2016, given its particular fundamentals. Actually, it should be in a position during the year to reduce its net debt. It will make a repayment of US$250 million on a senior note due in February, although it will repay this by drawing down from its credit facility. Although its current debt to cash flow is approximately 2.7x, it should be able to reduce this in 2016 to below the 2.0x level. It is of note that VET has largely avoided the issue of shares to raise capital. 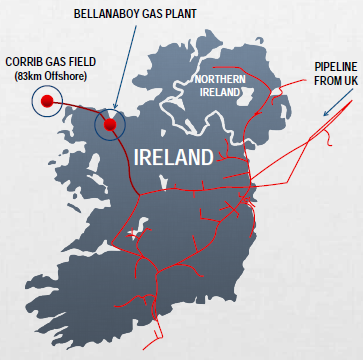 The Corrib natural gas project in Ireland is a major catalyst for Vermilion going forward. Corrib is an offshore Irish natural gas field with six drilled wells, connected by an 83 km. underwater and an 8.3 km. underground pipeline to an onshore terminal in Bellanaboy, Co. Mayo. VET holds an 18.5% Corrib interest. Shell (NYSE:RDS.A) (NYSE:RDS.B), with a 45.5% working interest, is the operator. Norway's Statoil (OTCPK:STOHF) holds the remaining 36.5%. Vermilion is a relatively late entrant to the project, having purchased Marathon's stake in 2009. At the beginning of 2015, Vermilion was confident that the project will be in production "in approximately mid-2015". As of September, the Bellanaboy plant was fully complete and tested. It is now entirely operational and ready to produce its first gas immediately. On October 8, the Irish Environment Protection Agency issued an operational permit (IPPC), and Shell awaited only a formal ministerial go-ahead from the Irish government to begin producing. It would take about six months for the project to ramp up to full production. The ministerial approval is still awaited. Moreover, on December 4, four Mayo residents went to the Irish High Court to challenge the EPA's grant of a permit. The action is not against the producers, but against the Environment Protection Agency and the Irish government, on the grounds that the EPA failed to carry out an adequate assessment before granting the IPPC. The court challenge is the latest in a series of legal challenges and environmental protests that have persisted for more than a decade and have resulted in major delays in Corrib's completion. (Development began in 2004.) The applicants are now arguing that the EPA must remedy all past failures of assessment and meet all EU standards. The judge who dealt with the action adjourned the matter to a date later this month (to be determined). Corrib is crucial to Vermilion and to its 2016 projections. Vermilion expected production to have begun by December at the latest, and has included some minimal Corrib production in its 2015 estimates. While what credence the court may give to the application of the residents is unknown, it is unlikely that the government would grant ministerial approval while the matter is still before the courts. A delay of any length would be harmful to Vermilion, for whom a full year's 2016 cash flow from Corrib is essential. Oddly, the delays in the project and the associated cost overruns are a negative for the Irish government, since the costs of the project can be used by the producers to defer the payment of royalties. At the moment it could be a full seven years before royalties are to be paid, which will significantly benefit the producers.